Some showers have very slippery surfaces, an issue that becomes detrimental if you have a tendency to easily fall over. This is especially true for elderly adults, whose hips and legs tend to be far weaker than the average person’s. It doesn’t matter if you’re looking for a shower mat for yourself, for your parents or for your grandparents… We’re here to help you decide which one to get! After reviewing many products and picking the market’s top choices, we’ve concluded that the Shower Mat by FeschDesign is a great choice for most standard elongated showers. 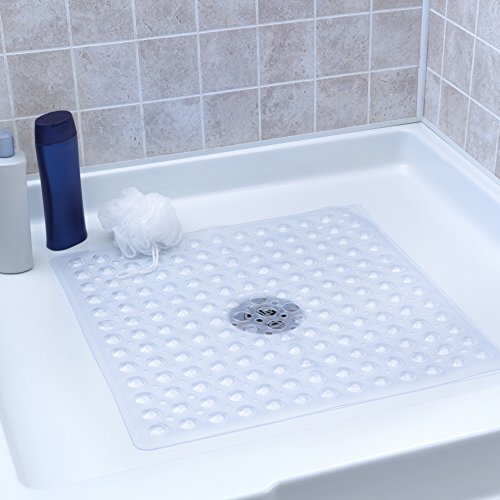 For square shower stalls, we recommend you take a look at the Vive Non-Slip Shower Mat. We’ve included several other options below for different shower sizes from square to extra long as well as a good stick-on option for extra security that sticks directly to the shower floor. This mat has an above average size, ideal to be used in long bathtubs or big showers as long as it doesn’t cover up the drain. The suction cups underneath it should grip to most common bathroom surfaces without too much trouble and its vinyl composition allows the product to be washed on a machine without any inconvenience. Apart from being a good choice for elderly adults, this product is also widely recommended for children as its size suits a child’s movements and the material will almost assuredly keep them from slipping. It is strongly suggested that you properly wash this mat before placing it on your shower – it could sometimes develop a small slippery layer during shipping which could cause the product to not fully represent its actual quality when placed. If your bathroom’s shower surface isn’t too smooth and even but rather has a few irregularities, we suggest you check out other products as this might not be ideal for your needs. It offers great length which allows the product to excel in long showers or bathtubs. The mat sticks pretty well to most plain surfaces, keeping owners from tripping while showering. Slip-resistance surface works well when properly attached to the tub’s floor. Folding marks caused by shipping might stay on the mat for longer than desired. Won’t properly stick to irregular surfaces. 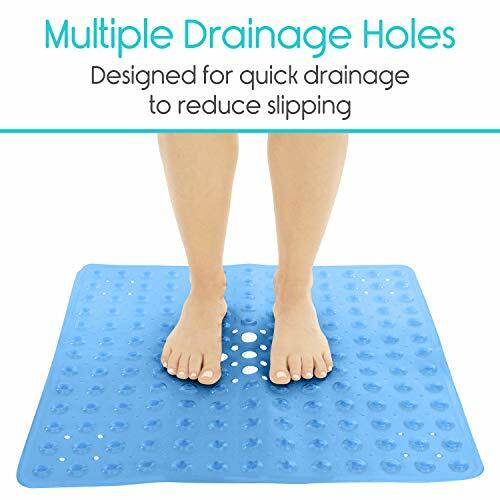 This mat’s particular design fits in the center of most square showers, as it has drainage hole made to be placed exactly above the shower’s drain. This permits the water to properly flow while also keeping the surrounding area slip-free. The design and simplicity also make it a great product for the elderly. Although the design is great for allowing the water to pass through, some shower floors might still keep water remnants beneath the mat. Even though it’s not ideal, it could be fixed by simply making a small opening in one of the mat’s corners. The product isn’t as large as other competitors, but it certainly offers what it advertises. Don’t be fooled by its size, though. Although smaller than others, it covers just enough ground in order for you to take a shower comfortably, and its grip to the floor also seems to be quite good even when compared to the best products on the market. The product’s design allows it to be placed in the center of the shower while also keeping an open way for the water to flow. Sticks to the ground as intended and doesn’t move once it’s placed. Good quality material and light texture make the product ideal for seniors or children. Could prove to be a bit small depending on the size of your shower. Might accumulate water beneath the surface if the floor has irregularities. The vinyl material accompanies this design ideally by offering great slip resistance in a big enough area of your shower. The mat has some issues when it comes to sticking to the shower floor itself, as it doesn’t have enough power to properly grip to some very slippery shower stall floors which do not work well with this mat, but if you have a standard shower floor it should work well. If you buy this mat, we advise you to try to keep it as puddle-free as possible – without properly filtering it; the mat could start smelling weird after a few uses. In any case, it’s comfortable to walk on it and the good features it has certainly outweigh the negative ones. If your shower floor isn’t plain, you should consider buying one of the previous mats that we’ve reviewed. The product sticks to its promises and delivers the features offered by the manufacturer. Leaving one of the cups unstuck to the ground allows the mat to dry up and not form any puddles after each use. Ideal size for small showers. Could smell after a few uses if it doesn’t dry up. It won’t stick to irregular or tiled floors – be warned! This mat is specifically made to fit on large tubs. It will stick to almost any smooth bathtub (and even showers), but the product won’t work well if your bathtub has an uneven surface. It needs a smooth floor to properly stick, otherwise, it won’t work well. Its design allows you to easily get rid of residue water every time that you clean it. It’s a great product when it comes to avoiding microbe growth in your tub. It’s also built with very soft fabric, which doesn’t only prevent you or your loved ones from falling when showering, but it also allows you to step anywhere comfortable without worrying about mat irregularities. As one huge additional bonus, this mat is also incredibly cheap. It’s not that easy to find large mats if you’re on a low budget – especially if you’re looking for quality. This affordable mat works very well and provides a great grip to your feet. 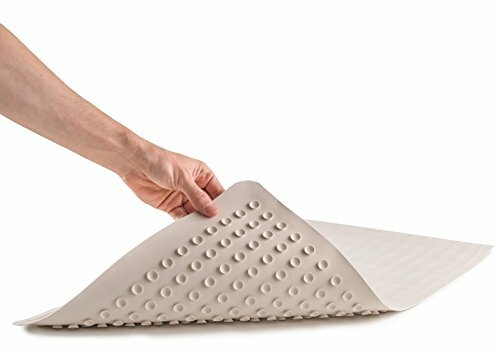 This mat by SlipX is made with vinyl fabric, which makes it very good at preventing you from slipping while showering. 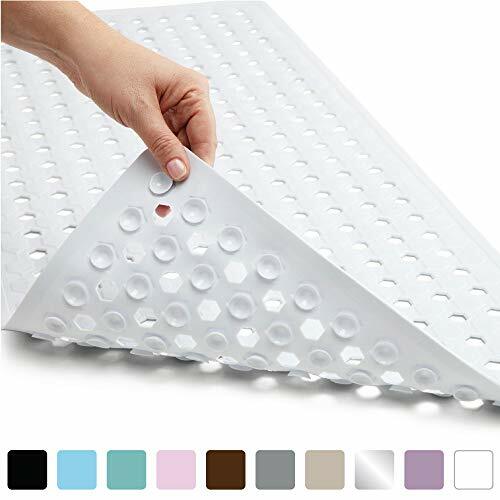 It also has a bunch of suction cups at the bottom – it’s one of the best mats that you can buy when it comes to sticking to most bathtub surfaces. 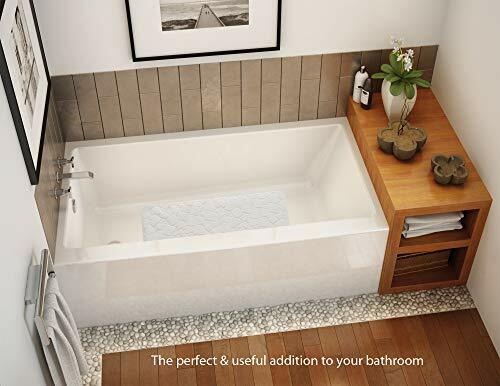 It is advertised as a product that only works on non-textured surfaces, but it can even stick well in textured surfaces if your bathtub doesn’t have a lot of irregularities. 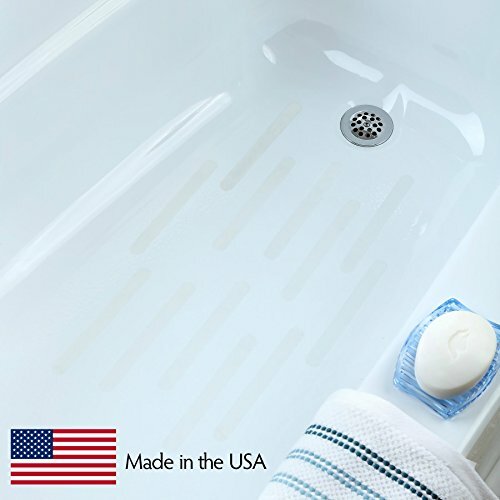 This mat is ideal for small tubs, though: it doesn’t come in a big size so you have to be especially careful around the border of the mat where it won’t cover all of the shower stall- depending on the exact size of your shower stall you could have several inches on all sides of the mat that are not covered. So it’s important that you measure your stall well before buying. The mat is also odor free, which is an advantage that shouldn’t be overlooked: low-quality mats tend to gather a lot of water and they start producing an awful smell with time. This mat avoids this issue very well. It might arrive folded after shipping, which prevents it from properly extending on your tub’s floor. The FeschDesign mat is made of high-quality rubber, and it offers a unique design on its upper part. It doesn’t only look good in most bathrooms: it also provides a great grip for your feet when you’re in the tub – even if you tend to shower with high water flow. If you’re prone to suffering from allergies while exposed to rubber, this mat is still ideal for you. It doesn’t cause rashes and does wonders for your feet’s skin. The design makes the mat a very easy-to-clean product as well. Since it doesn’t have a ton of irregularities on its upper part, you don’t have to worry about the mat collecting water and smelling badly after a few uses. Seniors can easily use this product and set it up without issues. It sticks very well to most smooth tubs and it doesn’t move once set up. This relatively small mat is ideal for those people who own small bathtubs as well as people who tend to shower without moving too much. It is very well made and built to last for a long time. As an added bonus, customer service offered by the manufacturer is absolutely amazing, and they’re open to helping out buyers if any issues arise. The product feels very comfortable to step on, almost like a cushion inside the shower. The one main drawback that we can tell you about is that the mat can lose its grip after using it for a few months. During the first 4 or 5 months, it will stick incredibly well to most tubs, offering a great grip for young and senior owners alike. Unlike many other products on our list, this mat can stick to tiled floors very well. Its suction cups are extremely solid and can offer true grip regardless of the floor in which the mat is placed. People use bath mats for many different reasons. 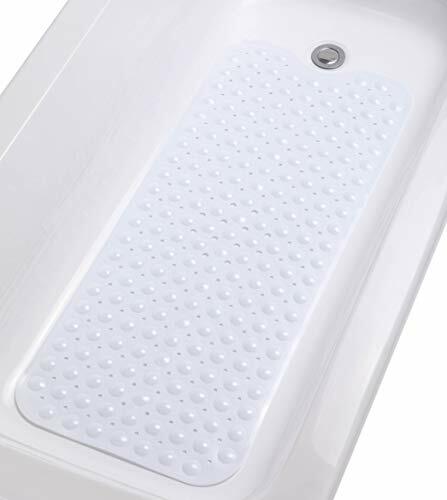 Products such as the Epica Anti-Slip Bath Mat provide owners with comfort and freedom. Although this mat looks smooth in plain sight, this mat by Gorilla Grip actually has a very simple but effective texture on its surface. This permits your feet to create a grip with the mat, which in turn allows you not to slip while taking a shower. There are also a ton of holes that go through the mat, allowing water to flow and avoid the creation of small ponds on top of the mat. This mat is also very large, meaning that it covers a lot of ground on your bathtub. As an added bonus for seniors, they don’t have to spend a lot of time cleaning it: you can simply throw this thing in your washing machine and it’ll be as good as new once it comes out. Looking for another type of non-slip product? We encourage you to check out these anti-slip shower grip treads… They can prevent you from falling and slipping, while also being an ideal alternative for seniors – they don’t have to be cleaned too often. These threads can grip incredibly well to most bathtub floors without needing a lot of time to set up. They are incredibly effective and don’t take as much space as a shower mat. As a matter of fact, these threads are easier to clean and healthier than a mat, as they don’t tend to allow the growth of bacteria on their surface. This product is a great anti-slip alternative to shower mats, and its high-quality makes it an ideal option for most homeowners. These are ideal to be used on any type of shower, as size isn’t an issue at all. You can just put them wherever you need them to be and they’ll work as intended. The stickers also have suction cups at the bottom. They can stick very easily to most smooth bathroom floors. Just be warned: they don’t work very well with tiled and irregular floors. Treads and mats have some significant differences, but they aim to do a similar job. The first thing you’ll notice about this mat is certainly its design. 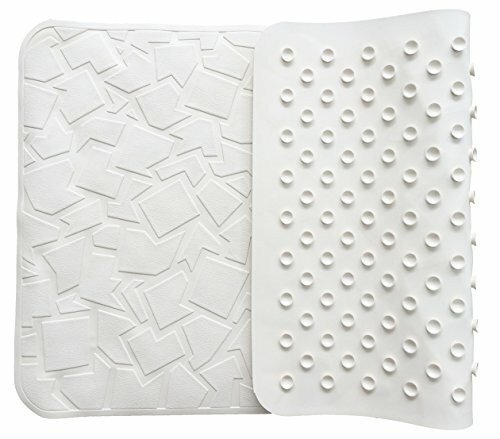 The product is made to resemble rocks in a bathtub – if you like unique things to decorate your home with, this mat is more than ideal for you. Its fabric seems a bit too smooth on the surface, but it should still provide quite a decent grip to prevent tripping in people of all ages (even seniors). It does have one major issue, though: you’ll need to straighten it for the first few days before it manages to stick properly. The way in which this product is delivered hinders its effectiveness until it can properly stick to the floor of your tub. Once you manage to achieve that, it’ll work wonders. You should also air it for a few hours before using it for the first time. This will get rid of the plastic smell that it has when newly unboxed. Top feature to look for is Anti-Slip bottom. Slip-resistant features: Although this seems to be the main purpose of a shower mat, some lower end products tend to offer poor slip resistance and could end up giving you a feeling of being unsafe rather than security when taking a shower. For seniors safety should be a top priority in the bathtub. Ability to stick: Apart from the mat’s anti-slipping features of the top surface where you stand, it should stay put wherever you place it. The ability of the mat to stay in one place often compliments its own slip-resistant features and gives owners a stronger feeling of security when moving inside the shower. Good suction cups are the key: the quality, number of them and the distribution of them along the bottom (especially the corners) is the feature to look for. Mold-free lifespan: Shower mats are probably the one shower commodity that gets the most exposure to the water flow. This makes both the design and its material’s quality very important as it should be able to properly offer the water a way to drain in order to keep it from developing mold. It gets harder for many older adults to do a deep cleaning of the bathroom, so having a mold and mildew resistant bath mat helps keep things hygienic. Overall, the Shower Mat by Vive offers the most varied amount of features while keeping its negative attributes to a minimum, making it come ahead of the competition in our shower mat review. The other products we talked about might be more of your liking, so don’t be afraid to check them out in any case! If you are accessorizing a shower for an elderly person and are looking to improve the safety of your shower, you may want to check out these shower grab bars and these heavy duty shower stools and chairs. An elevated toilet seat with risers and handles can also make your bathroom much more accessible, especially for an older adult or anyone with mobility issues as the seat sits several inches higher and the handles help them get on and off the seat much more easily. If you want to keep your shower tidy and well organized, feel free to check out the rest of our bathroom product reviews!